CAMPBELTOWN, Scotland -- The word "enchanted" describes just a smattering of courses around the globe. But if you take a ferry near Royal Troon on Scotland's Ayrshire Coast, cross the Isle of Arran, then hop on another ferry to the Mull of Kintyre (or suffer through the four-hour drive from Glasgow) and ramble down to the far tip of this remote peninsula, you'll find a course where that description is hardly apt. Machrihanish (Mach-ra-han-ish). Just saying it, the way it rolls off the tongue in four soothing syllables, conjures up romance, uplifting things, even the sublime. A rather ancient route by the great Old Tom Morris, Machrihanish Golf Club (can't get enough of that name) is a course that's generally not included in the diets of most links lovers. It's simply too difficult to get to. And given the full page that's needed for jotting down the directions -- and the plethora of links courses that pepper the mainland -- it's understandable. But, trust me, those who make the effort get rewarded. Big time. Hard on the shores of the Atlantic near Campbeltown, Machrihanish is still, however, not a forgotten links. Ask any Scotsman who has zeal for the game, and he'll gladly tell you about Machrihannish -- and there'll be a twinkle in his eye when he starts going on about it. For this is a course that slips and slides through some of the most impressive dunescapes that any golfer, or non-golfer alike, has ever known. The front nine, in fact, has been described as one of the best opening nines in golf. And the starting hole, "Battery," now there's an opener! It's been heralded as one of the finest opening tee shots in golf. Thought that might perk up some ears. Inches from the pro shop sits the first tee, the ocean, and a gorgeous beach that sweeps off to the left. 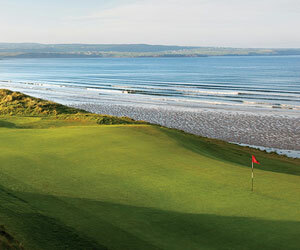 Following the beach, curving with the shoreline, is the first fairway, a par 4 of some 430 yards. If you bite off a sizeable swath of beach, it's just a short iron in. However, if you bail to the right (that would be me), you'll have a long iron in. Magnifico! Game on! It is indeed a thing of beauty. Easily one of the most rousing starts in the game. And from there time stops and the course just loses itself in the dunes. One hole after another slipping through perfect, mystical, magical duneland. Thank God they had neither the will nor the wherewithal to move much dirt in 1876. For such is the "enchantment" (there's that word again) of Machrihanish. It's a course that's routed strictly through what God gave it -- and he was in a fairly giving mood that day. According to the great Tom Morris, who routed the course in 1876, it is a place "Specially designed by the Almighty for playing golf." Greens and fairways, surrendering to how the wind chose to knead the sand. Can it get any better than that? Never! For God himself will never be equaled as a course architect. Like so many of the wonderful links of yesteryear, Machrihanish goes nine out and nine in. Consequently, the back nine is further from the sea, and the route does lose some steam. In fact, the 17th and 18th are run-of-the-mill two-shotters that do seem rather bland. If this weren't the case, then Machrihanish would surely crack the top-100 lists of golf's major periodicals. But, alas, Machrihanish is what it is: an incredible head-rush for 15 holes, or so, then a pleasant -- if not anticlimactic -- stroll to the finish. Because of the challenge in getting there, one should settle in to a nice hotel in Campbeltown, or, preferably, book into one of a couple of inns in the seaside village of Machrihanish and play the golf course a couple of times. But a visit to these parts, especially if you're on the "tough-to-get-to links" quest -- and you don't mind sipping a famous single-malt Scotch or two -- should proceed to the Island of Islay, a two-hour ferry ride away. Islay, most famous for its fine collection of whisky distilleries -- Bowmore, Lagavulin, and Bruichladdich ring a bell? -- is a wind-swept, more barren island than some of its close friends. The Island of Arran, for example, which you'll need to cross if you're going to Kintyre via a mainland ferry, is a much prettier looking place. In fact, they call Arran "Scotland in miniature." For it holds mountains and lochs in the north and rolling hills and meadows in the south, all surrounded by a gorgeous coastline. But Islay is well worth a visit and it too is rich in golf history. The Machrie Hotel & Golf Links, which dates back to 1890, is a stand-alone stronghold where the game still clings to a charming, grassroots form. Where Machrihanish is the quintessential romantic links, Machrie is links golf at its eccentric best. It feels brash, almost boorish, has more blind shots than you can count on one hand (including the approaches at both the 17th and 18th), but is thoroughly engaging from start to finish. Stripped of all the ornaments, even lonely at times (the hotel takes on the same feeling), Machrie easily could pass as the "holy of holies" for the purists of the game. And, in fact, there's proof of that. James Dodson, author of many fine books, states (about Machrie) "my hands-down favourite golf course in the world." For such is the pull of a great 100-year old links that lies tucked away, showing negligible scarring from too-eager architects who like the knife. The meat of the course, naturally, is the epic run along the sea. In Machrie's case, and similar to Turnberry, it's the third through the 10th. After playing the short par-3 10th with a quirky little pond the main source of trouble, the course takes a turn back toward the rustic hotel and once again relies on the heavy winds and waist-high fescues to provide the defense. Consider yourself warned: Machrie, with its wild and wavy grasses, can be very punishing on those who choose to be a wayward. Pack an extra sleeve as finding balls in the rough is, well, tough. When hopping on the big plane, spending the thick wad of cash that's necessary to satisfy the old-world cravings, it's understandable that you'd want to stay within arm's length of the Turnberrys, the Prestwicks, the St. Andrews, etc. But if you want to expand your horizons, get really adventurous, throw a little remoteness into the mix, then I know just the place, Machrihanish Golf Club. And now, so do you.